Every Saturday morning, volunteers equipped with gloves, masks, and knee-high gum boots can be seen wading in the murky waters of the Bagmati, fishing out solid waste by the tonne. These volunteers from all walks of life—from activists and celebrities to students and security personnel—have been coming to the banks of the Bagmati for 252 continuous weekends now. The initiative, Bagmati Clean-Up Mega Campaign, has been one of the most celebrated recent public campaigns and on average extracts about 10 metric tonnes of solid waste from the river each week. Since its initiation in 2012, the campaign has drawn hundreds of thousands total volunteers, extracting nearly 9,000 metric tonnes of solid waste. 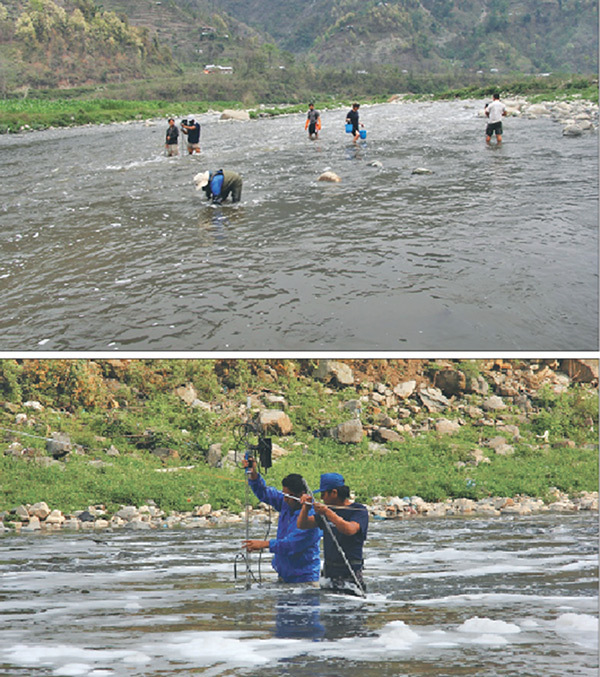 The Bagmati River Expedition 2015, led by professor Deep Narayan Shah of Tribhuwan University, revealed some crucial information regarding the state of the river’s water quality, one of which was the biological death of the river. For the expedition, Shah had put together a team of postgraduate students from the University to set out on a 15-day journey to study the entire 200 km length of the Bagmati River—from its headwaters at Baghdwar to where the river crosses over into India at Rautahat. One of the key findings of the expedition was that nearly 60 km section of the river—from Sankhamul to Manthali—is biologically dead. “The term ‘biological death’ refers to the lack of conditions to support life,” says Shah, “It is one of the most serious conditions found in any river, an extreme point caused by unchecked pollution.” According to the professor, a follow-up study in 2017, also showed that despite the hundreds of tonnes of solid waste that was extracted from the river, the amount of pollutants in the water remained well over the guidelines set by the government. The expedition, according to Shah, made its final assessment based on 38 different parametres among which is the l the concentration of chemicals such as ammonia and phosphates in the water. These values are measured in ‘milligrams per litre, mg/l’, measuring the mass of chemical per every litre volume of water. A guideline issued by the Government of Nepal puts the value of ammonia concentration in drinkable water to be at 1.5 mg/l. But ammonia concentration of 85.6 mg/l was found in 2015 at Dakshinkali. And in the 2017 follow-up expedition, the level stood at about 46 mg/l, despite the test being conducted at the height of monsoon, when the river is comparatively cleaner because of the surge in water flow. Likewise, guideline for the concentration of phosphate stands at 0.6 mg/l. But concentration in Bagmati’s waters was 25.3 mg/l and 19.33 mg/l at Dakshinkali in 2015 and 2017 respectively. According to Shah, sewage, industrial, municipal waste and fertilisers are the primary liquid pollutants. But these pollutants are “impossible to segregate manually” without scientific plants that treat the water with chemicals. Currently, the Guheshwori treatment plant is the only operational water treatment facility in Nepal. It collects household, hospital, and industrial wastes from areas north to it and treats it before releasing it back to the river. Mala Kharel, a member of the board of directors of the High Powered Committee for Integrated Development of Bagmati Civilization (HPCIDBC) shares that as Bagmati clean-up drive has always been about igniting a wave of awareness among the citizenry, other additional components are necessary to ensure a complete restoration of the river’s water quality. Such infrastructural inputs are now clicking into motion, shares Ashish Ghimire, the Project Director of the Bagmati River Basin Improvement Project under the HPCIDBC. Ghimire’s team is working on a new action plan which aims to free Bagmati of liquid waste in the next three years. Ghimire shares that by the end of 2020, waste water treatment plants will go live at five different locations. Including the Guheshwori plant, whose capacity is also being upgraded, plants at Sallaghari, Balkumari, and two more at Sundari Ghat are in the works. Simultaneously, HPCIDBC has also been working on the river basin improvement program that was initiated in 2014. Under this project, two dams—Dhap and Nagmati—are being constructed in the watershed areas around Shivapuri. These dams, which will store water throughout the monsoon, will regulate the flow of the river during the dry seasons. “Today, the low water discharge is one of the major problems with Bagmati.” Ghimire says, “On average, the flow of water in the river might be around 40 litres per second. Upon the completion of these dams, we hope to increase the flow to around 400 litres per second. This will dilute any liquid waste, complementing that the work the treatment plants will be doing.” Along with the two major dams, there will also be 11 mini water regulatory dams in between the seven kilometres stretch from Gokarna to Sinamangal. If these planned projects come to fruition, they will become major milestones in the bid to rid Bagmati of its liquid pollutants and its eventual rejuvenation. But both Ghimire and professor Shah reiterate that much work still lies ahead.